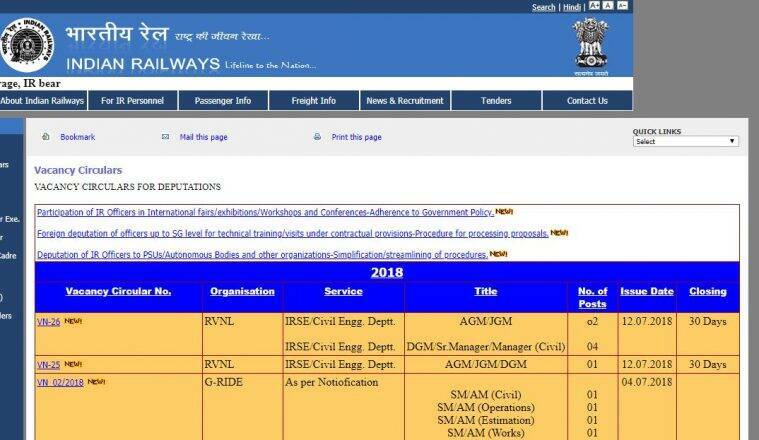 RRB recruitment 2018: Interested lot can apply at the official website — indianrailways.gov.in. Those possessing construction experience will be given preference. RRB recruitment 2018: The duration of the contract will be five years. RRB recruitment 2018: The Indian Railways has issued recruitment notifications, inviting eligible and interested aspirants to apply for the positions of manager at Chandigarh and Solapur on deputation. The duration of the contract will be five years. Those possessing construction experience will be given preference. Aspirants can apply at the official website — indianrailways.gov.in. AGM: The aspirants should be officers of civil engineering department holding posts in analogous grade (CDA/IDA) or posts in Level-13 (CDA) and having 12-14 years’ service in group ‘A’. JGM: The aspirants should be officers of civil engineering department holding posts in analogous grade (CDA/IDA) or posts in Level-12 (CDA) and having 8-12 years’ service in group ‘A’ . DGM: The aspirants should be officers of civil engineering department holding posts in analogous grade (CDA/IDA) or posts in senior scale (level 11) post or posts in Gr ‘B’ (Level-10) and having 10 years of service in group ‘B’ . Senior Manager: The aspirants should be officers of civil engineering department holding posts in analogous grade (CDA/IDA) or posts in Level-10/Level-9 (CDA) taken with four years service in group ‘B’. Manager: The aspirants should be officers of civil engineering department holding posts in analogous grade (CDA/IDA) or posts in Level-8, group ‘B’ (gazetted). Age limit: The age of the candidates should not exceed 56 years.